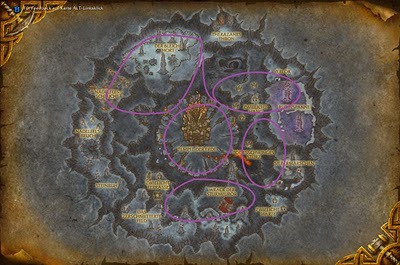 I had some time on the Beta to figure out some Herbalism routes for the upcoming Cataclysm expansion. I mainly did this for the purpose of leveling Herbalism as fast as possible. This might give you a headstart in Herbing and you can also use the Routes for leveling. The Herbs gathered in the first few days/weeks can be sold for a very nice ammount of money. And since you guys are probably going to have the "best" routes to get as many Herbs you can in the beginning this is going to make some gold for you! 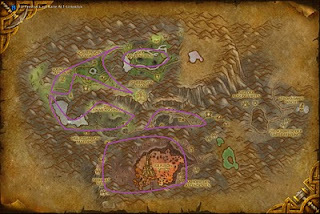 You will gather Cinderbloom, Stormvine and Azshara's Veil here. Here is the 1st image of my Routes. You may start at any Point you want to. I came out with an average of 3-5 stacks after i used the routes. If youre thinking of leveling herbalism, you can stay in hyal until skill 500, although i would go to Deepholm if you are level 82 already , at 475. Next up is Deepholm. The Herbs here are everywhere. And i mean it, really everywhere, so there is no "real" route to this, but to give you an Image of the routes i checked, and were most usefull i created another route plan!